Barceló Raval Hotel: has the Raval exceeded its tourism carrying capacity? 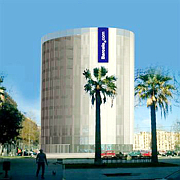 The 5-star Barceló Raval Hotel located on the Rambla del Raval, opens on September 24 2008 with a key role in transforming the once infamous Barrio Chino (Chinese District) of south El Raval. The hotel is the flagship of a development which includes the Catalan National Film Library, private and public housing, the headquarters of the Transport Workers Union and quality shops. The Barceló Group have invested 35 million euros in the hotel project, taking a considerable risk. They hope to attract business executives as well as tourists, taking advantage of the Raval's central location. However, there are reservations about its success. The potential conflicts created by a 5-star hotel and high-level design in an area of residents with few economic resources are strong. South Raval has the highest concentration of slum conditions and poverty in the city. The toughest challenges come from speculative pressures, that often take the form of landlord intimidation against long-established low-rent tenants, and social integration, which requires fighting the marginality that still lingers in the area. 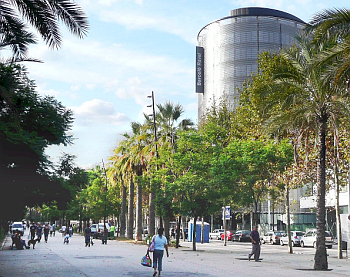 Interestingly, this very marginality that the Barceló Raval Hotel is planned to transform, is a substantial part of the tourist attractiveness of the area. The highest concentration of slum conditions in Barcelona is found in the neighbourhood known as the Raval, and most specifically Southern Raval. This area was traditionally known as the Barrio Chino, or 'Chinatown', and, partly because of its proximity to the port, has been characterized by marginal activities and the highest levels of poverty in the city. It has also traditionally served as the gateway for new immigrants to the city, providing cheap lodging in very poor conditions, in the form of boarding houses, dormitories and subdivided apartments. The buildings in this area vary in age – some are several centuries old – and the existence of slum lodgings in the area can be traced back at least to the mid 19th century. Local businesses are confident about the therapeutic value of the development. It is hoped that the hotel will act as a lever to attract more private investment. Economic spread effects would radiate outwards, removing the negative image of the neighbourhood. Many neighbours, however, feel that the city is too visitor-oriented to the detriment of residents. Three more luxury hotels in the Raval are already in the planning stage and there are increasing complaints about the lack of housing and social facilities and the excess of tourist facilities. This has led to common resentment of the large number of tourists in the area. A council official, Rita Gonzalez acknowledges the imbalances that so many luxury hotels in a district lacking in housing and social amenities can create. This has led to an overall rethinking of the area, with a neighbourhood project now planned for Joaquin Costa street, in the north of the Raval. Although not wishing to talk about moratoriums, Gonzalez believes that "we need a study on the tourism carrying capacity that the Raval can withstand" and indicated that in south Raval there will be more housing because hotels "undermine neighbourhood activity." The most defining element of the Barceló Raval Hotel is its elliptical shape. "It was not an easy building", underlines the architect Jose Maria Guillen White, deputy director of the Barceló development group. The solution has been to raise a central core of concrete, as a backbone, and then some side pillars, so that the rest of the area remains clear. The hotel has a height of 37 metres, 186 rooms and a conference hall. The roof terrace offers one of the most spectacular views of the city. "The hotel is strategically situated in the heart of the city, in El Raval, the most fashionable area in the centre of Barcelona." "This new, avant-garde hotel complements its fashionable surroundings of the Rambla del Raval, in Barcelona’s cultural heart. The Raval has recently undergone a transformation to make it one of the city’s trendiest districts, with highlights including the MACBA contemporary art gallery. Take in 360-degree views of the surrounding area from the hotel’s roof terrace."